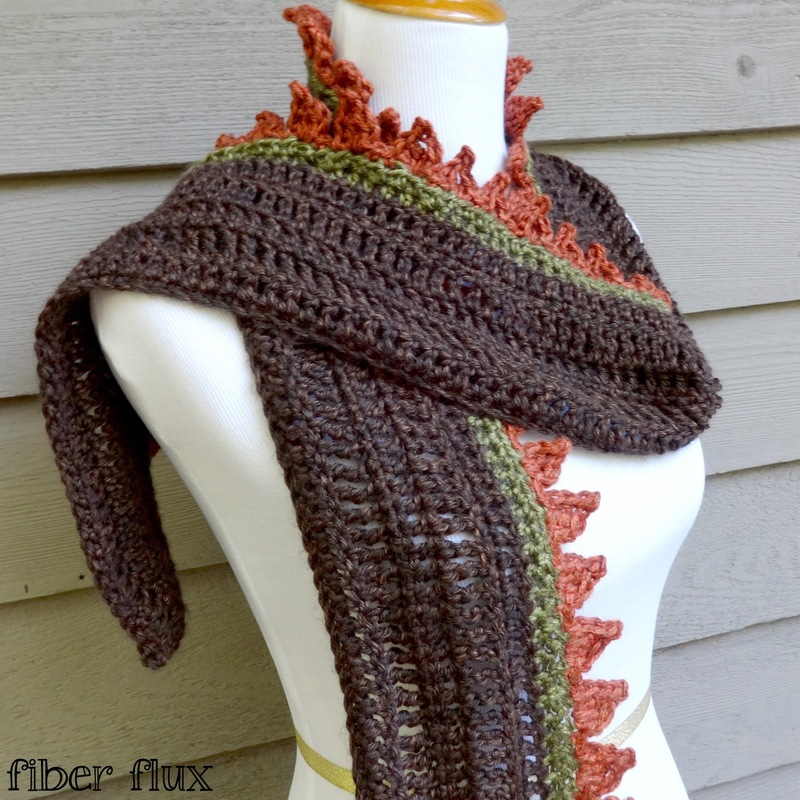 Fiber Flux: Free Crochet Pattern...Pumpkins On A Fence Scarf! 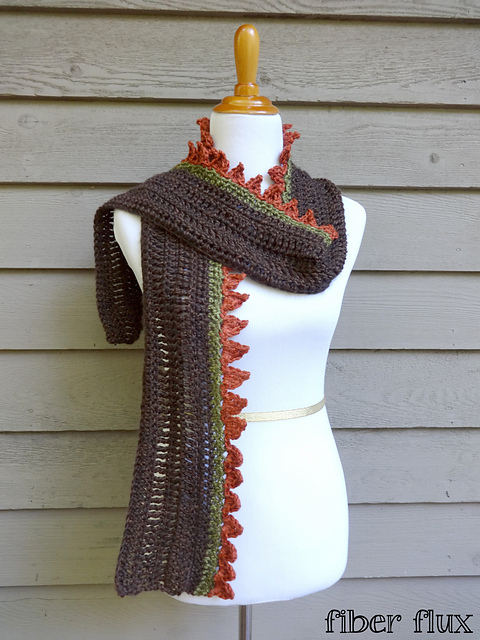 Free Crochet Pattern...Pumpkins On A Fence Scarf! 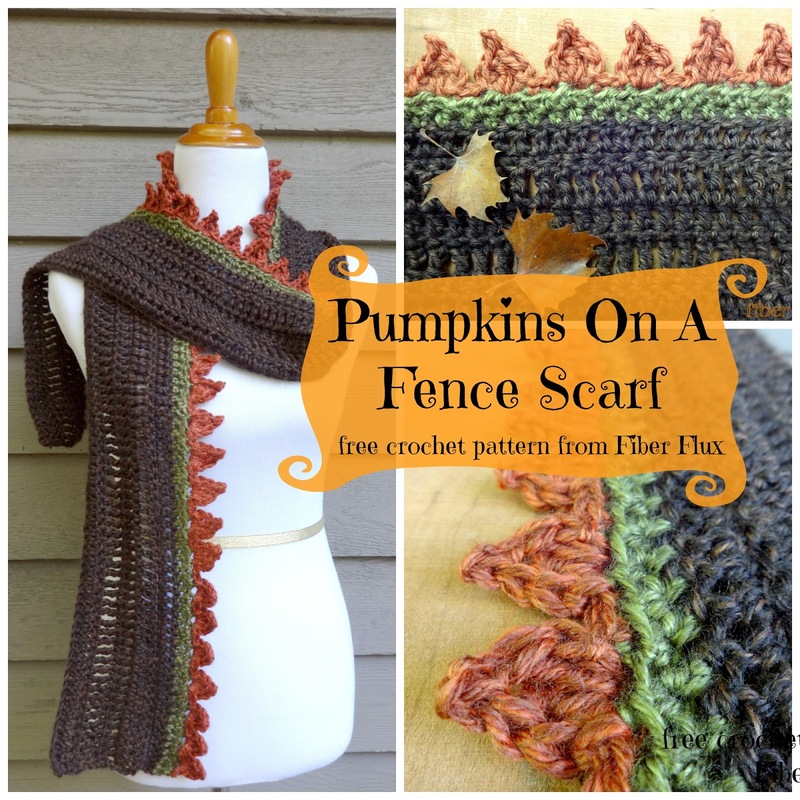 The Pumpkins On A Fence Scarf is a cheerful autumn accessory that celebrates the fall season. Fast and easy to crochet too! Row 1: In the second ch, work a sc. Work a sc in each ch across. Row 2: Ch 3 and turn (counts as a dc). Skip the first st and work a dc in each st across. Row 3: Ch 4 and turn (counts as a tr). Skip the first st and work a tr in each st across. Row 1: Ch 2 and turn. Work a hdc in first st and each st across row. Repeat row 1 and fasten off green yarn. Switch to orange yarn for pumpkin row. Row 1: Ch 1 and turn. *Work a sc in the first st, a sc in the next st. In the next st, work a sl st, dc, tr, ch 3 and work a sl st in the third ch from the hook, then a tr, a dc, and a sl st all in the same stitch. Repeat from * to the end of the row. Fasten off. 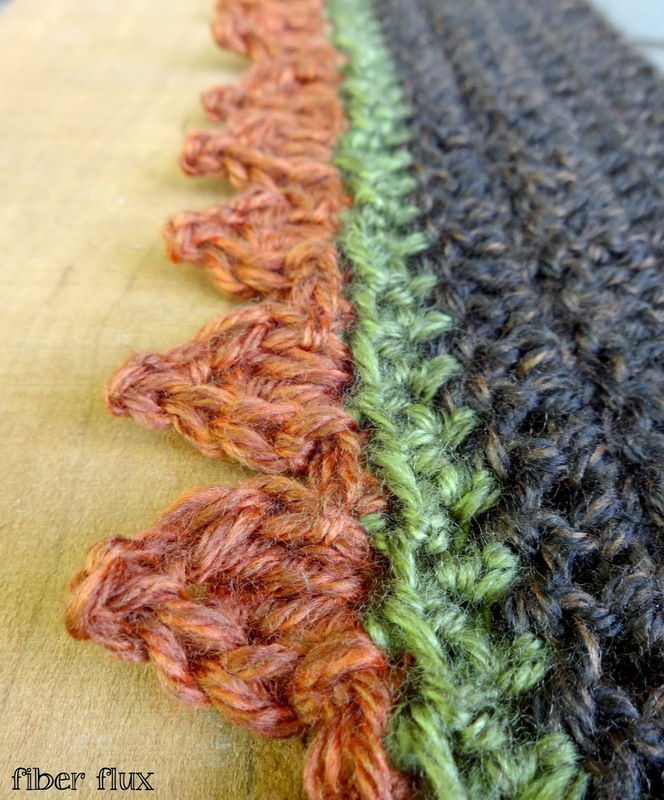 Note: Scarf is worked in multiples of three (see beginning of instructions). However, if the stitch count is off for some reason and you have an extra stitch or two on that last row, just add a sc in between a pumpkin or add an extra pumpkin at the end. Buen día. ¿No hay vídeo de esta bufanda?. Muchas gracias por todo lo que aprendo de usted. Hola, buen día. Le agradecería me dijera donde puedo encontrar el vídeo de esta bufanda. Gracias por todo. The print option on several pages has disappeared. Is there another option? I enjoy everything you've done and have begun printing off the patterns and put them in a binder for easy reference. Thanks for your easy to follow directions.